Secretary of State Mike Pompeo arrived in Saudi Arabia on Saturday on a hastily-arranged visit to the Middle East as the United States aims to muster support for new sanctions against Iran. The visit to Riyadh, Jerusalem and Amman just two days after Pompeo was sworn-in comes as President Donald Trump is set to decide whether to pull out of the 2015 nuclear deal with Iran that is still supported by European powers. “We are urging nations around the world to sanction any individuals and entities associated with Iran’s missile program, and it has also been a big part of discussions with Europeans,” Brian Hook, a senior policy advisor traveling with Pompeo, told reporters. Hook said a salvo of ballistic missiles fired into Saudi Arabia by Yemen’s Iran-allied Houthi movement that killed a man earlier on Saturday had been provided by Tehran. “Iran’s missiles prolong war and suffering in the Middle East, they threaten our security and economic interests and they especially threaten Saudi Arabia and Israel,” he said. The 2015 deal that limits Iran’s nuclear program in return for sanctions relief does not cover its missile program. Trump has called it the “worst deal ever” and threatened to re-impose sanctions unless Britain, France and Germany agree to fix it. Resuming sanctions would likely kill the deal. Russia, China, Germany, Britain and France, which all struck the accord with Iran and the United States, see the deal as the best way to stop Iran from developing a nuclear bomb. 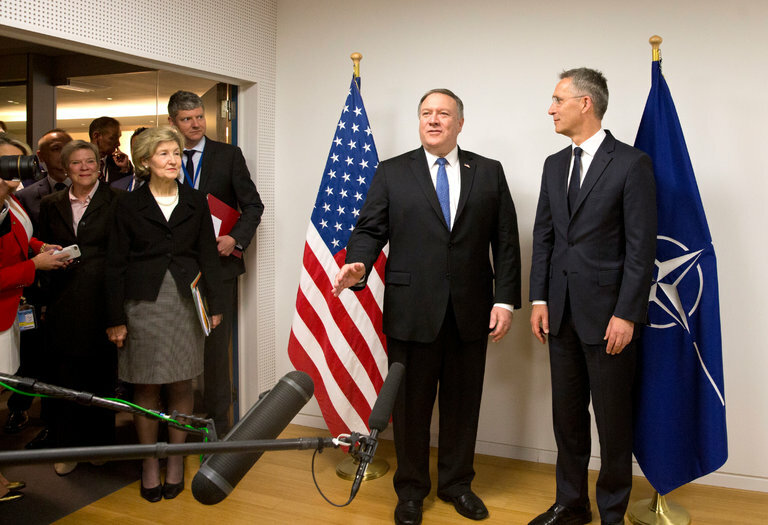 Speaking after a NATO foreign ministers’ meeting in Brussels on Friday, Pompeo said Trump had not taken a decision on whether to abandon the deal but was not likely to stick to it without substantial changes. “There’s been no decision, so the team is working and I am sure we will have lots of conversations to deliver what the president has made clear,” Pompeo told a news conference. Earlier this week French President Emmanuel Macron called on Trump not to abandon the deal, although he later acknowledged he thought he would pull out. The Trump administration is also currently reviewing the U.S. role in fighting Islamic State in Syria’s seven-year conflict. Trump has called on Gulf countries to provide funding and troops to stabilize areas once controlled by the group in Syria. Pompeo was one of the first Trump administration officials to visit Saudi Arabia early in his tenure as CIA director. 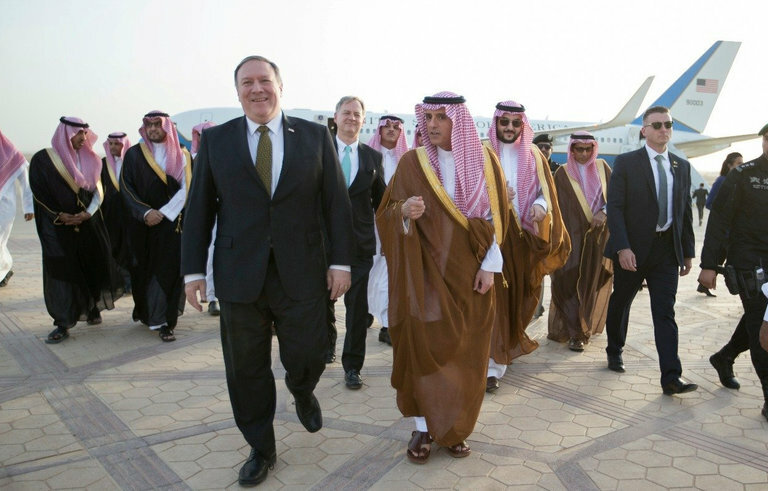 In Riyadh, Pompeo was greeted on the tarmac by Saudi Foreign Minister Adel al-Jubeir. He is expected to meet Saudi Crown Prince Mohammed bin Salman and King Salman during the visit.